I really like the papers you used! Nice colors and pretty two pager! 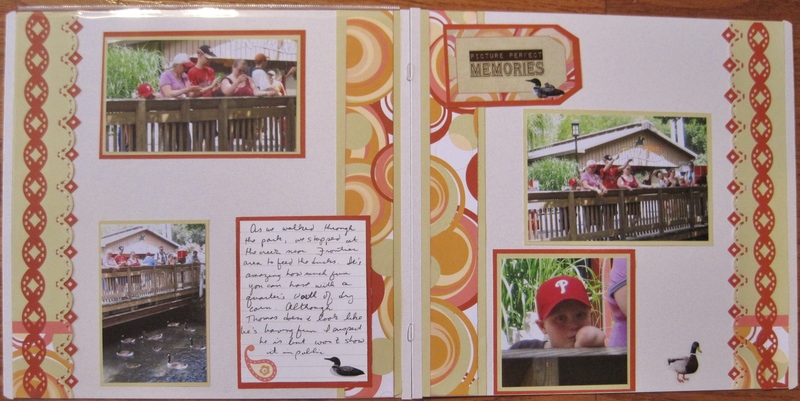 Picture perfect memories, nice layout! creative double pager with those pps. Great double pager with some cute pics. WAY to use those odd-sized papers! I'm super impressed! Love how you used those borders here! Whatever we have to do to make the papers work, love that you extended the edges with your boarders. Your punched borders on the each side are wonderful. They really add so much to your double. I have the same papers and love how you used it. I love the little ducks you added to the paper, tag and journaling block. Looks like they may be stickers - they are perfect.